Been hidin' out and layin' low with a nasty cold for the past few days, but now I'm playing catch-up with a jumbo trade recap post. 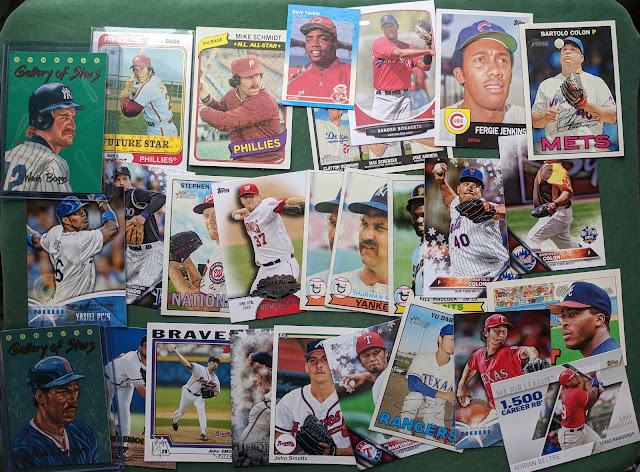 Yep, my trader buds have been out ta get me closer to finishing up some classic sets. 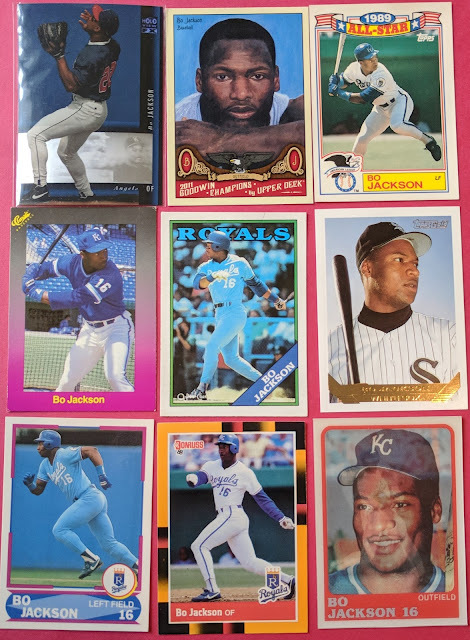 Turrdog has hooked me up with some great cards in the past, but may have outdone himself this time. 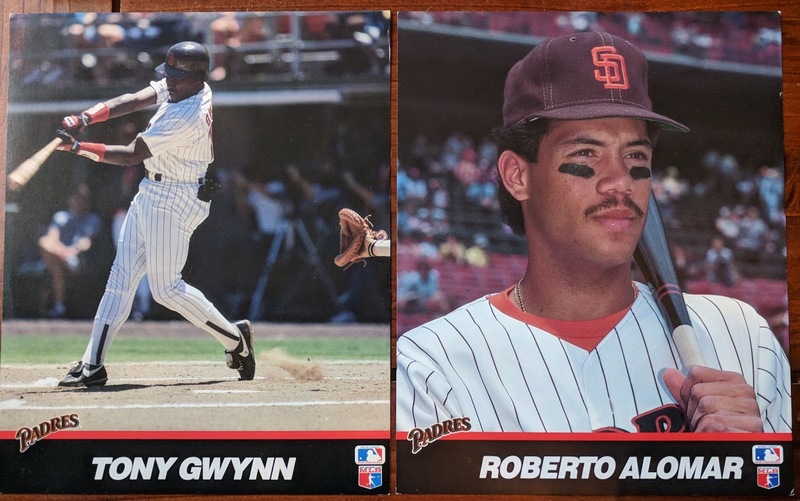 Along with the Gwynn I already had, this pair knocks off the Big 3 rookies in 1983 Topps. And lots of starpower here, too. 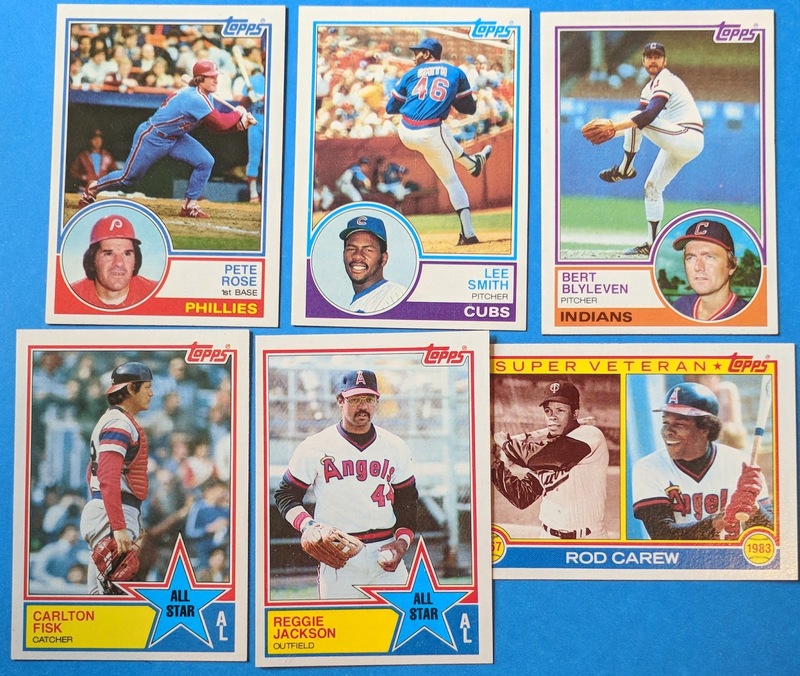 And he crossed off a bunch of my remaining 1984 Fleer needs with these 10 HOFers. Big thanks, Turrdog! I'll do my best to round up some thank-you cards soon. 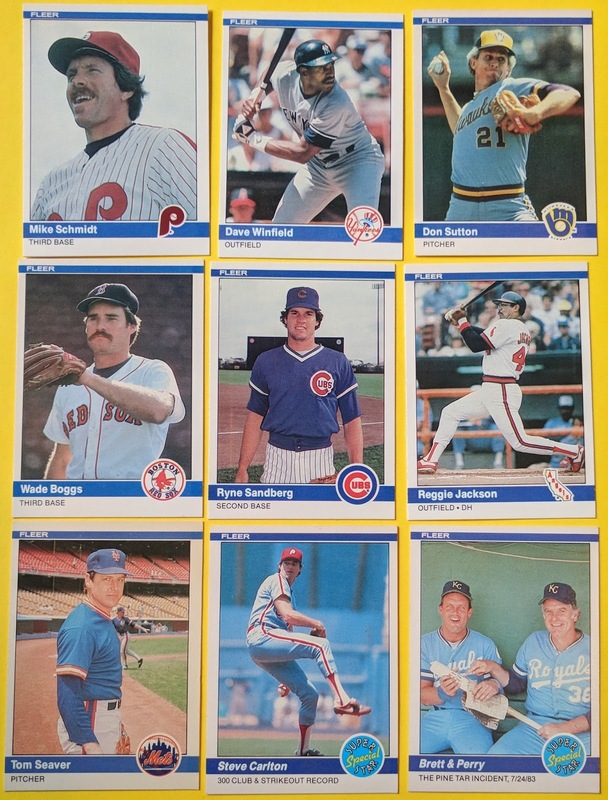 Another nice lot of '83 Topps needs. 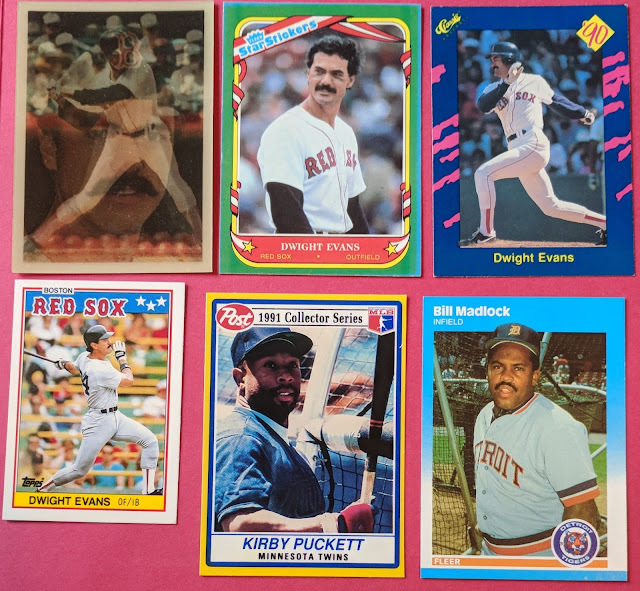 Some guys I collect, with Dewys and a Puckett and Madlock (had the Madlock in the PC, but needed one for the '87 Fleer Update build). But the real star of GCA's package was the onslaught of Bo Jackson cards. 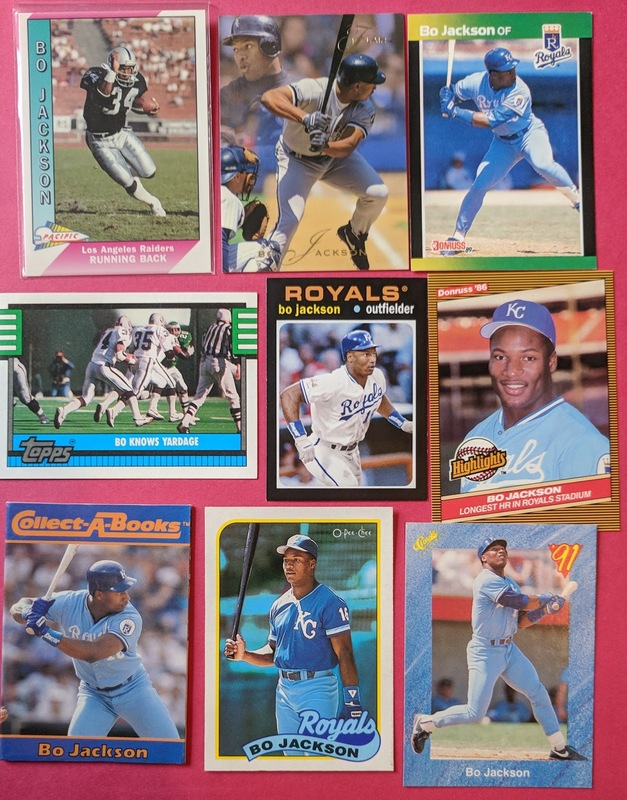 He's got a pretty legit Bo PC and was able to dig up a bunch of dupes I could use. 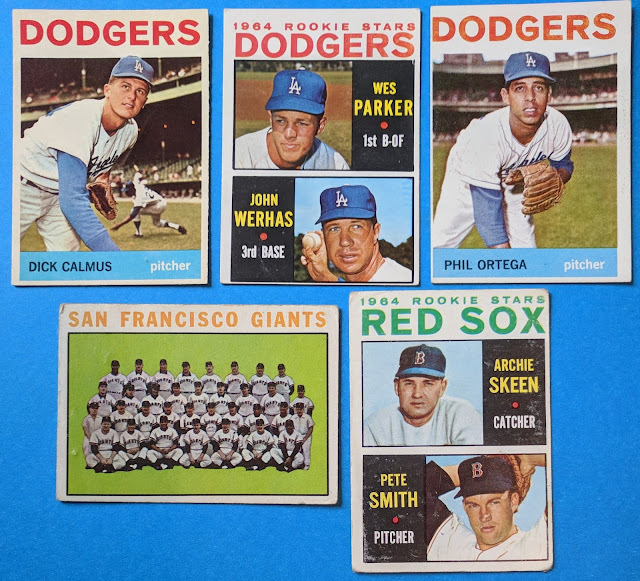 Great selection from various sets. Thanks a lot, GCA! I'll hit you back with some cards right away. Next up is good ol' mr. haverkamp lending a helping hand again. Ripken and Rose were big ones to cross off the '84 Fleer list. A bunch of good '83 Topps cards too. I'm really nearing the finish line with these 2 sets now! My updated wantlists can be found on this post. Jim also found some '64 Topps needs for me. Slowly creeping up to 50% complete there. And a Mad Dog. 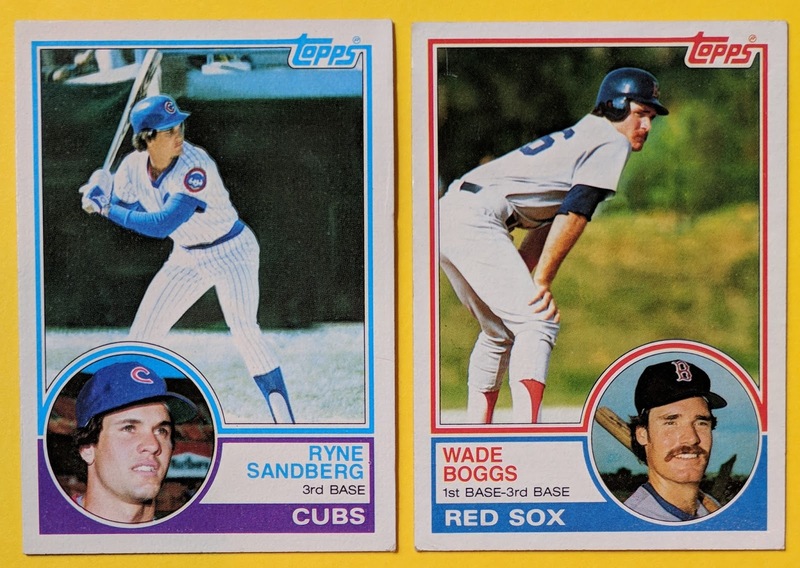 Had this in my '80 Topps set, but now here's one for the PC. Thanks as always, mr haverkamp! Just let me know if I can ever return the favor! 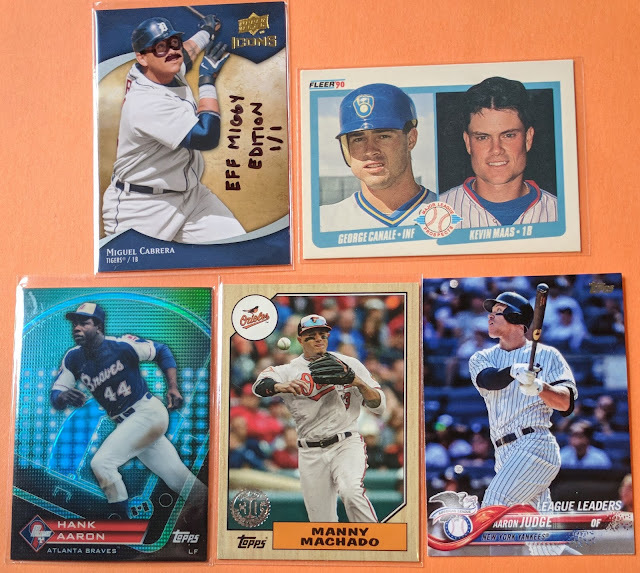 Next up is a package from Paul at Scribbled Ink, who recently sent out a bunch of cards in conjunction with a contest he ran while pissed at Miguel Cabrera for pulling out of the Tigers preseason fan event. Love the "1/1"! That shiny Hank is a beauty too. 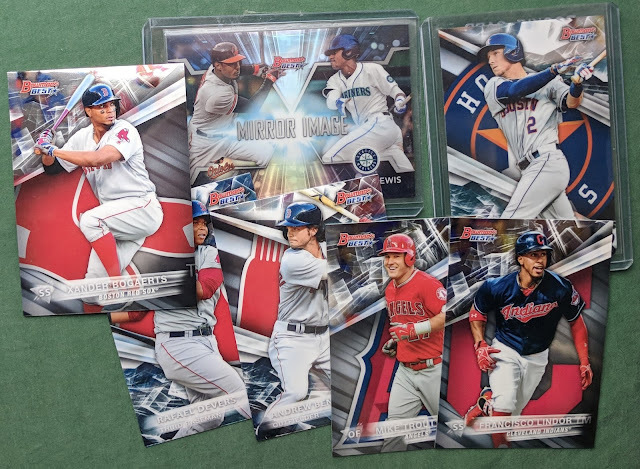 And the thrill of receiving Aaron Judge cards in trade hasn't worn off for me quite yet. And a nice lot for my Marquis Grissom PC. 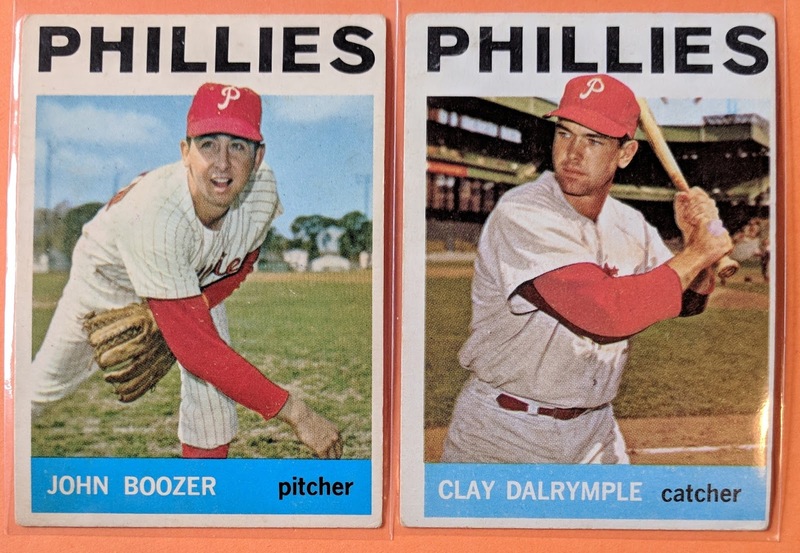 Also a couple cards for my '64 setbuild. Already had the Dalrymple, but needed the Boozer. Cheers! And here's a surprise mailing from Bru at Remember the Astrodome. Thanks for thinking of me, Bru. I'll shoot some Astros your way soon. 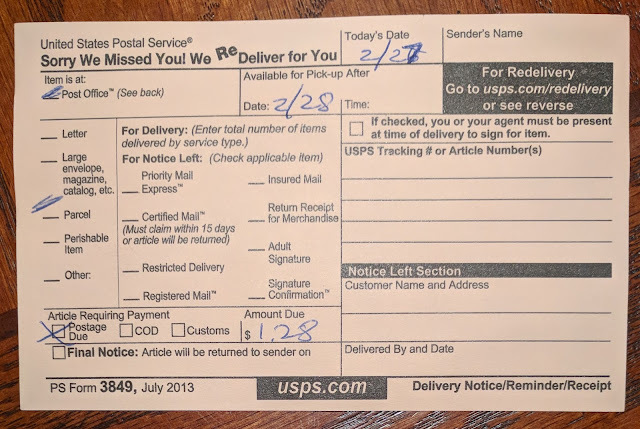 Last package for today comes via the Lost Collector. 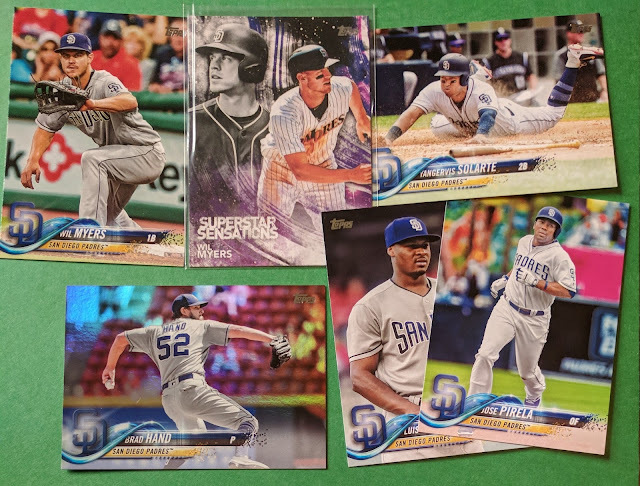 Solid assortment of 2018 Topps Padres. 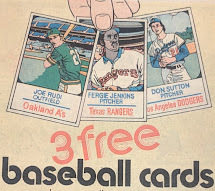 Didn't have any of these yet. 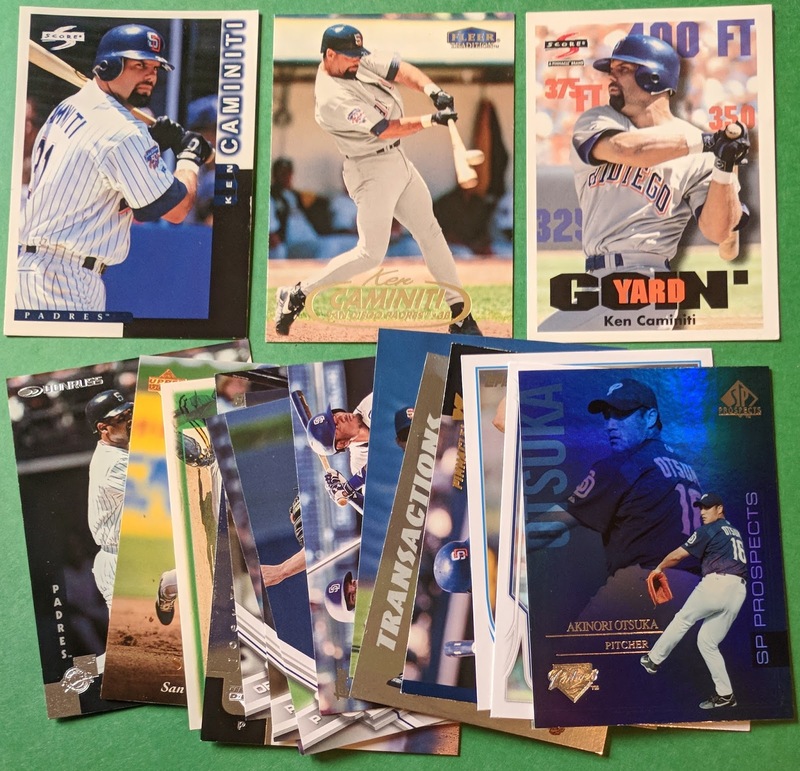 And some older Padres cards, highlighted by a Caminiti trio. But the gem of the package was this manurelic (that Topps erroneously refers to as a patch) of young slugger Rhys Hoskins. My first "hit" of the guy, it's a blue parallel, numbered /99 on the back. 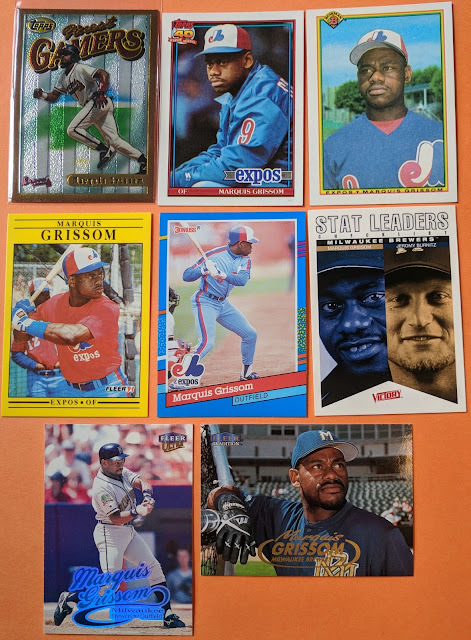 Thanks a lot for the trade, AJ! Bummer. Looks like there should have been one more mailing in this post, but the mystery sender skimped on the postage. Hopefully I end up with it sooner or later. Take that one to heart! Thanks for stopping by. 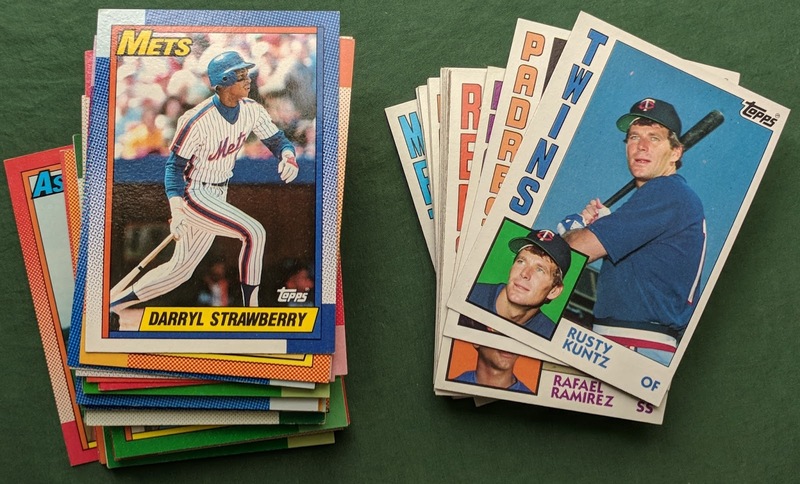 This post has an important preface before we get to all the cards. I love making fun custom cards... but I hate their nefarious sibling: the counterfeit. 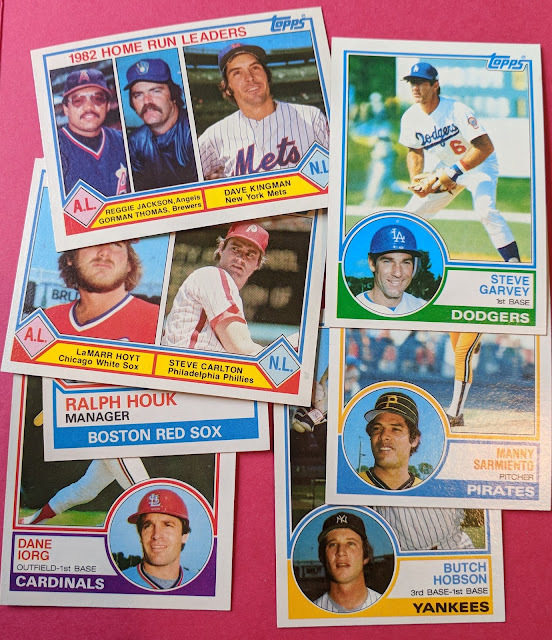 Up till this point, I haven't made a true "custom [pre-printed] autograph card" though I have done facsimile autographs on vintage card designs that called for it such as 1977 Topps (and I enjoy making customs to get real TTM/IP signatures on). But printing out a signature with any attempt at appearing as a legitimate autograph just sickens me. 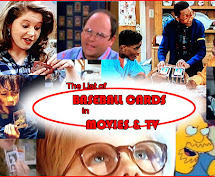 I know there are guys out there who do it, cranking out fake Babe Ruth cut autos and such to sell on eBay. 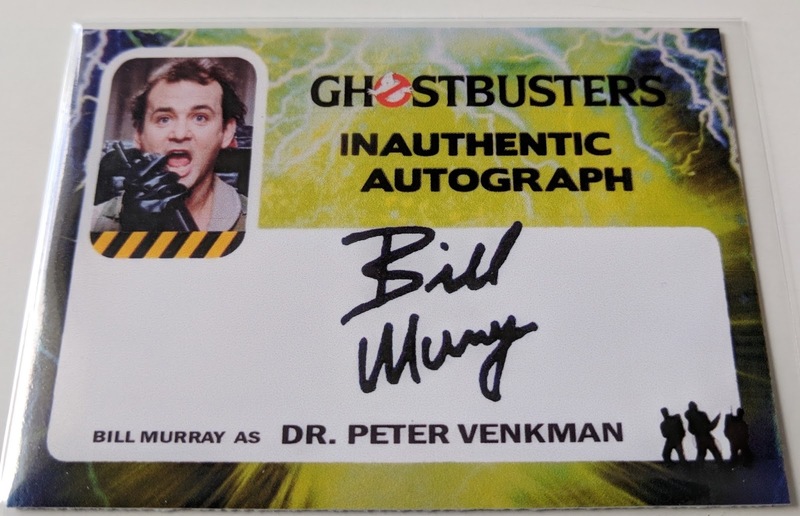 And even if they state in small print on the back that they're not authentic, stuff like that still bothers me a lot. So I was reluctant to begin the project I'm going to feature today. 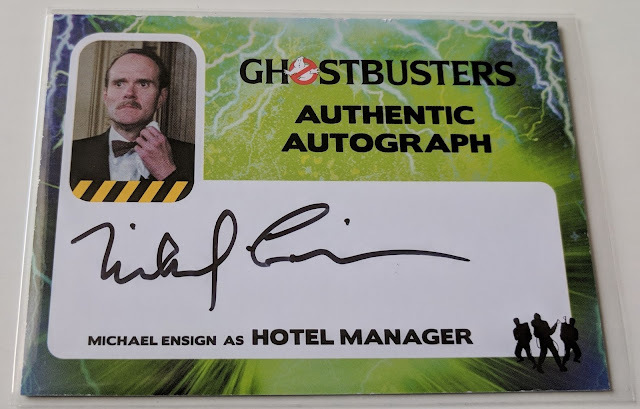 But when the 2016 Cryptozoic Ghostbusters card set came out, I and many other fans were disappointed that many key actors weren't included on the autograph checklist. 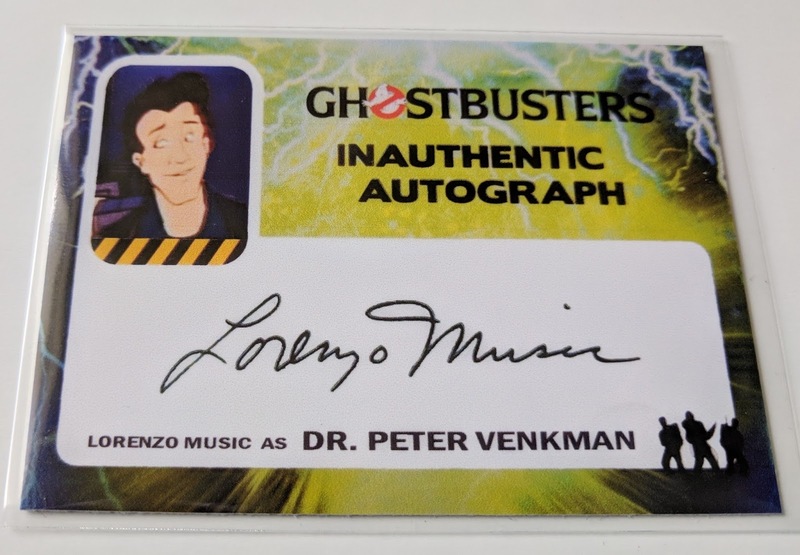 And so I thought it'd be fun to fill in the blanks, while clearly indicating that these are in no way real ("Inauthentic Autograph" in big letters, right there on the front). 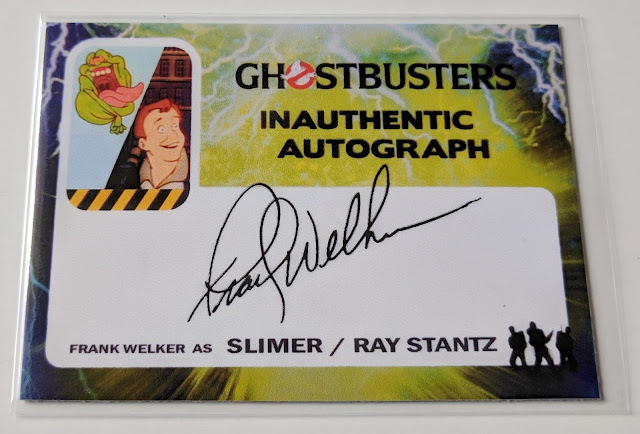 Plus, the set also includes "Totally Fabricated" slime memorabilia cards, so with that precedent established, creating "Inauthentic Autograph" cards would fit right in. Bill Murray is one of my all-time favorite actors. He doesn't have any certified auto cards out there, as he's a well-known flakey freebird who doesn't have the attention span to sit down and sign a stack of cards. So here's a fake one I made. I'm very happy with how it turned out! This is a real one. I'm gonna mix them up in this post to keep you on your toes. 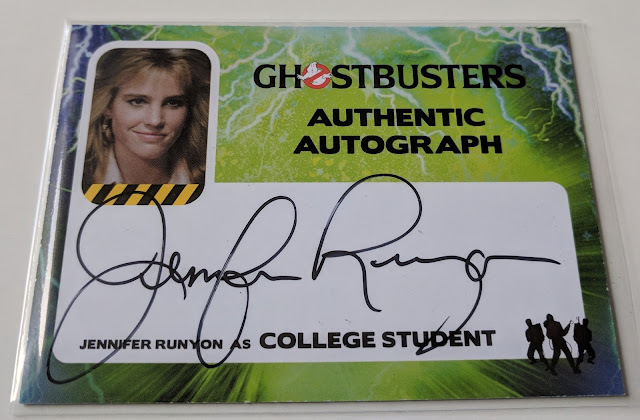 Jennifer Runyon really got Ghostbusters off and running with her scene near the beginning of the 1984 film. Such a cutie! I also know her for her role as Gwendolyn, Charles' girlfriend for a couple of seasons of the show Charles In Charge. She's got a couple recent acting credits, but has pretty much been retired for the past 25 years. Michael Ensign was great as the snooty hotel manager (you know, where they first encounter Slimer) in the 1984 film. Turns out he's had small parts in other big movies too, such as Superman (1978), Pink Floyd – The Wall (1982), WarGames (1983), and Titanic (1997). Lots of TV appearances too. 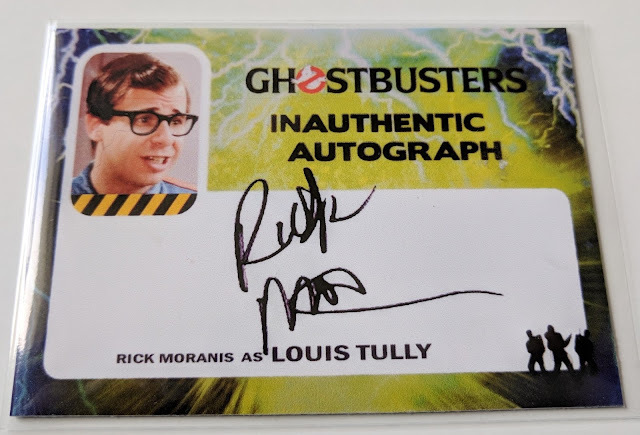 Oh man, you gotta love Rick Moranis! From his early SCTV "Bob and Doug McKenzie" days though his heyday in big movies such as Spaceballs and the Honey, I Shrunk the Kids saga. And of course his Louis Tully character played a key part in both Ghostbusters films. He's pretty much been retired since the 90s, focusing on raising his kids since his wife passed. I think he says he's not exactly retired, just really picky about what projects he chooses to work on. 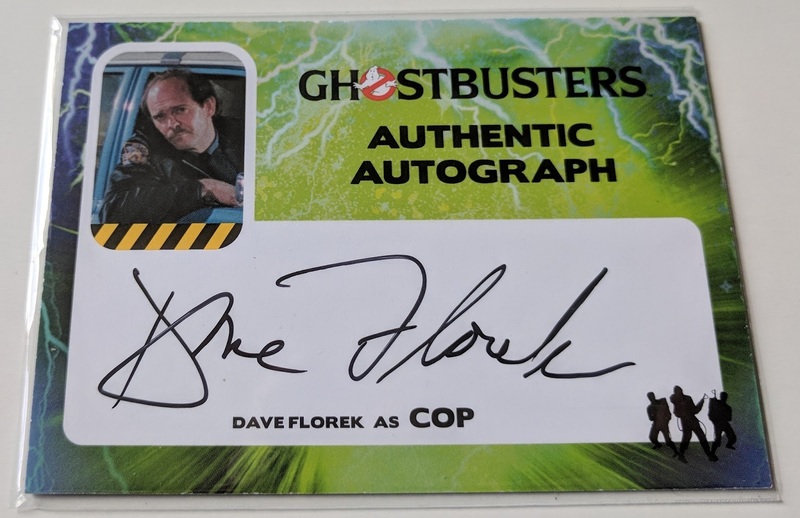 I'm sure Cryptozoic at least asked him if he wanted to sign some cards for this product, but he likely turned them down politely, like he turned down other acting roles over the past 20 years. But this custom helps me fill the void. 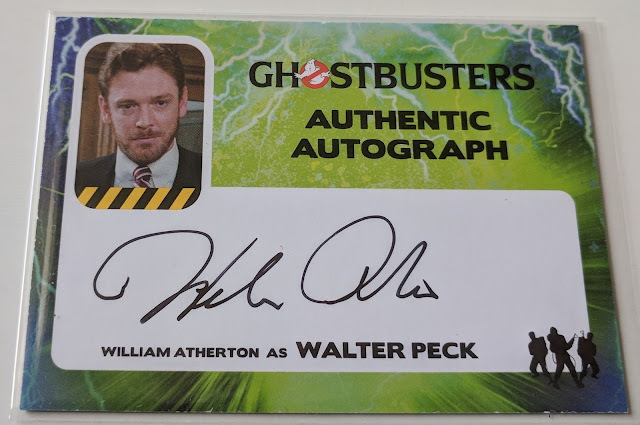 William Atherton was great as EPA prick Walter Peck in the first Ghostbusters movie. He also had a big role in the 1985 cult classic Real Genius, as well as the first two Die Hard films, and is still active today at age 70. 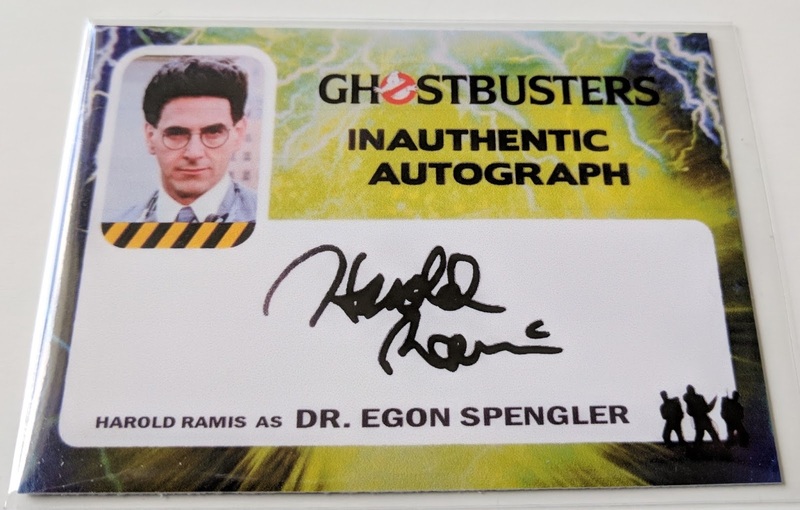 Melancholy tip of the cap to Harold Ramis, who not only was perfect as the nerdy Egon, but also co-wrote Ghostbusters with Dan Aykroyd, and was also a driving force behind the classics Caddyshack (1980), Stripes (1981), National Lampoon's Vacation (1983), and Groundhog Day (1993). Sadly he passed away at 69 in 2014, so he wouldn't have been around to sign cards for this set, but thanks to my imagination, here's a custom "card that never was" autograph card. In the Real Ghostbusters cartoon, Egon was played by Maurice LaMarche. 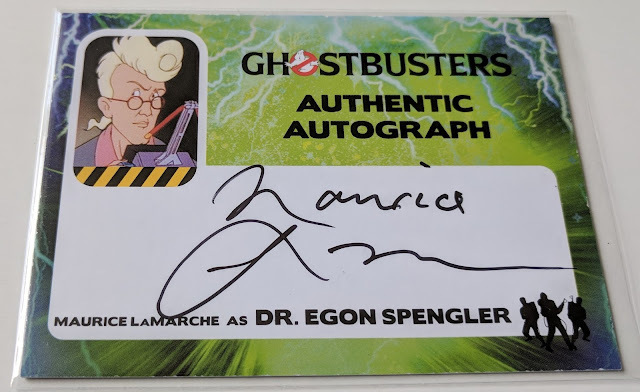 He's done lots of other voice acting over the years, such as popping up as minor characters on The Simpsons from time to time, Futurama (Kif, Morbo, Calculon, and more), and Animaniacs (as Brain in Pinky & the Brain). He also delivered one of my favorite-ever lines in an episode of The Critic playing Orson Welles in a commercial for peas saying how they're "full of green pea-ness (Oh God, that's awful!)".. Still cracks me up! This is a real auto I'm happy to have. Here's another real one. 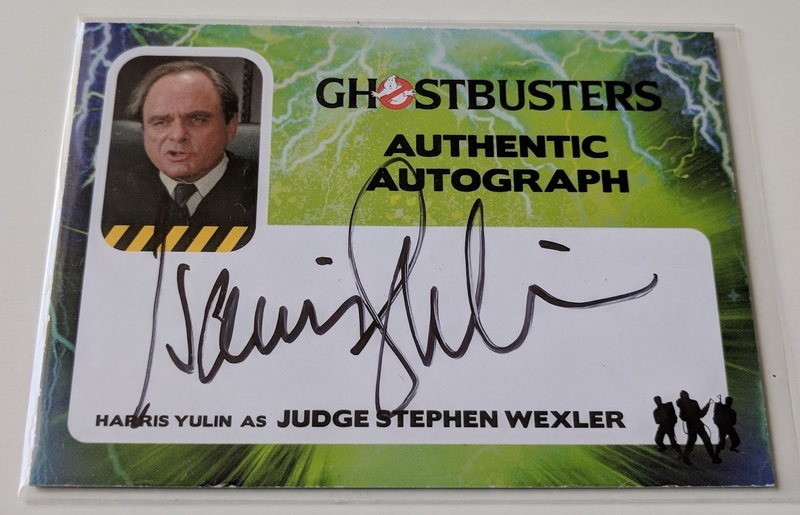 Harris Yulin played the judge in Ghostbusters II. He's also been in Scarface (1983), Clear and Present Danger (1994), Training Day (2001), and had a Primetime Emmy Award Nominated stint on Frasier in 1996. 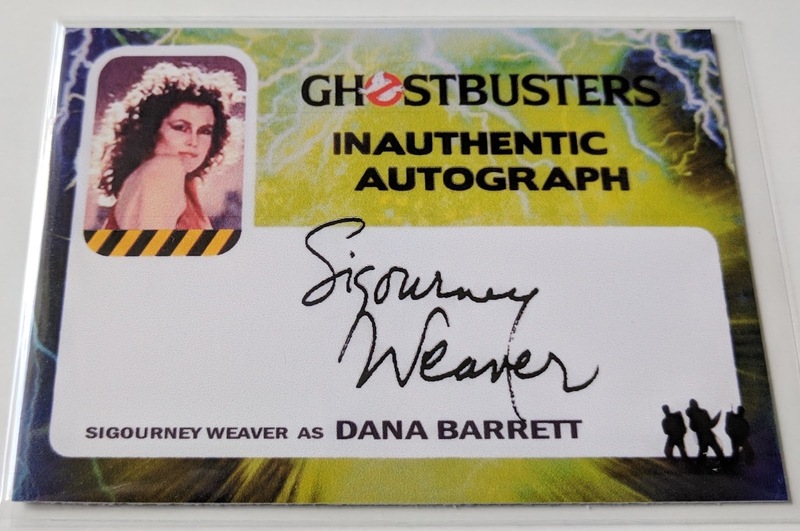 Sigourney Weaver! 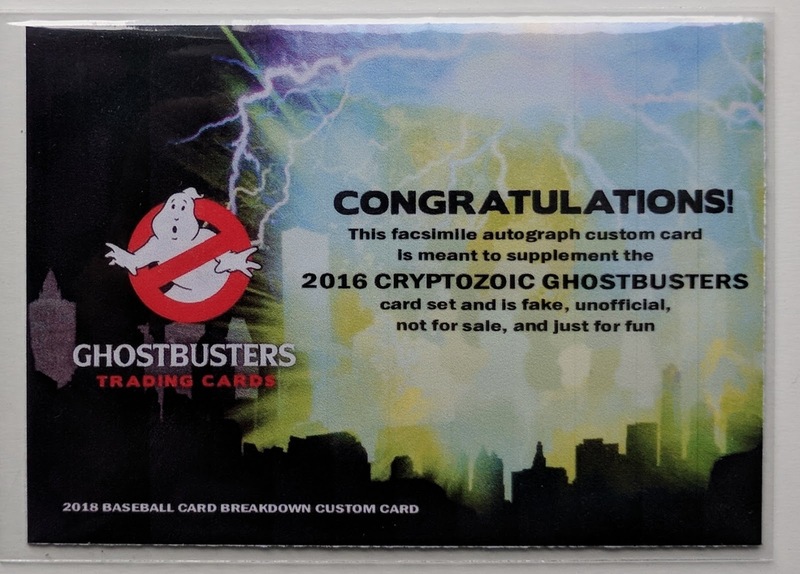 This is another fake one I was forced to make, as unfortunately she wasn't included in the 2016 Cryptozoic product. Believe it or not, I only just this past month finally watched Alien and Aliens. She really is great in that franchise, though to me she'll always first and foremost be Dana Barrett from Ghostbusters 1 and 2. Dave Florek is surprisingly one of the tougher autos in the set. He just has a small part in the second film, a cop hassling the Ghostbusters for drilling in the middle of the street. Since then, he had recurring roles on The Fresh Prince of Bel-Air and Grace Under Fire, plus guest spots in big TV shows such as Seinfeld, That '70s Show, and Bones, among others. He's still active today, with his latest appearance being on the Young Sheldon show. It really bummed me out that Cryptozoic didn't really acknowledge the great soundtracks of the two films in this card set. 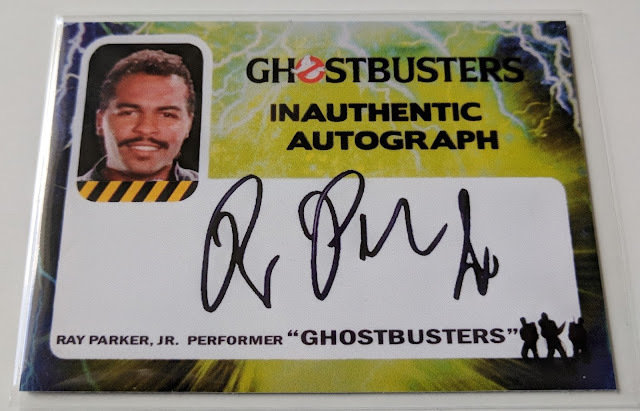 I mean, I guess they did have Bobby Brown as an autograph subject (crediting his bit part as the mayor's doorman), but the lack of Ray Parker, Jr. was a big hole in my opinion. I assume they must have asked him, but I guess he wasn't interested (wah?!). No matter, I made this custom to partially right that wrong. Sure, his big song was a ripoff of "I Want a New Drug" but it was still a great tune. 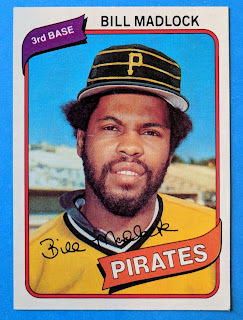 He had a few other decent hits (I'm partial to "You Can't Change That"). Larry King is an American icon, the classic suspender-wearing newsman. 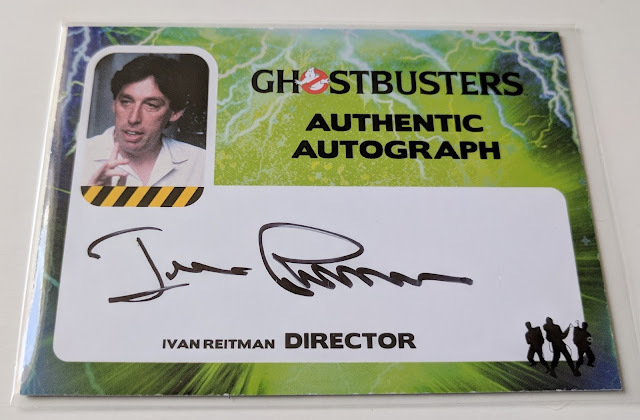 He had a tiny part as himself in the original Ghostbuster movie (during the montage of the Ghostbusters gaining popularity), and ended up with an auto card in the set. He's spent years interviewing the world's most famous people on radio and TV, with a long daily run on CNN, still at it at age 84, on air somewhere. Nice pickup! 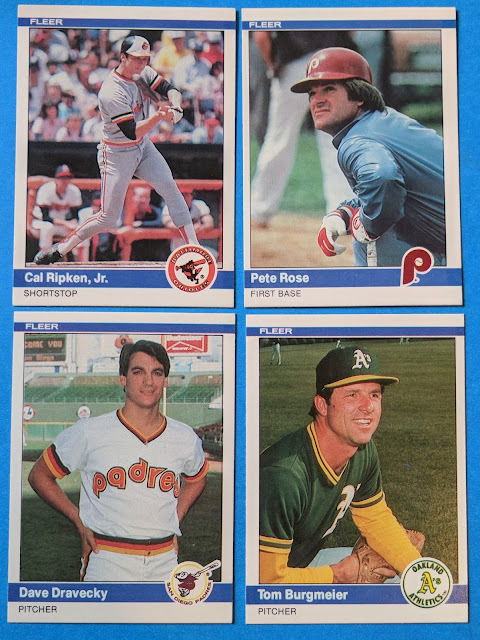 As for baseball relevance, he's a prominent Dodgers fan (dating back to their Brooklyn days), and got a lot of screen time seated behind the plate during the LA games of the 2017 World Series. 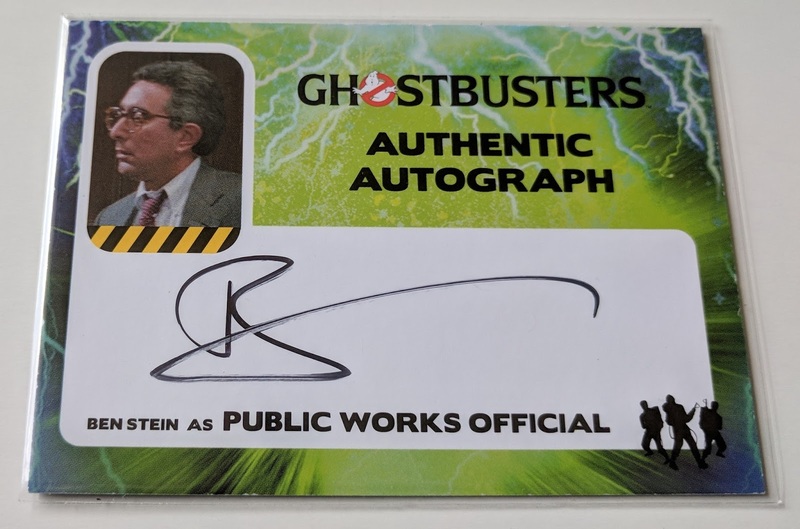 Another household name who had a small Ghostbusters part, Ben Stein had a little one-line part in Ghostbusters II as a public works official concerned about the rising paranormal activity. He's best known for his part as a monotone teacher in Ferris Bueller's Day Off and also had a decent part in The Mask. I'll always remember him for his run on Win Ben Stein's Money, the turn-of-the-millenium game show on Comedy Central. My opinion of him has been soured a bit in recent years due to some of his views, but still glad to add his auto, even if it's probably the laziest in the set, just a fancy B. If there were a Mount Rushmore of voice actors, Frank Welker would have a good argument for placement on it. I didn't realize it till researching for this post, but he's the voice of Fred on Scooby Doo (and always has been), and he's done a ton of other stuff over the years, from Megatron on Transformers to Nibbler on Futurama. 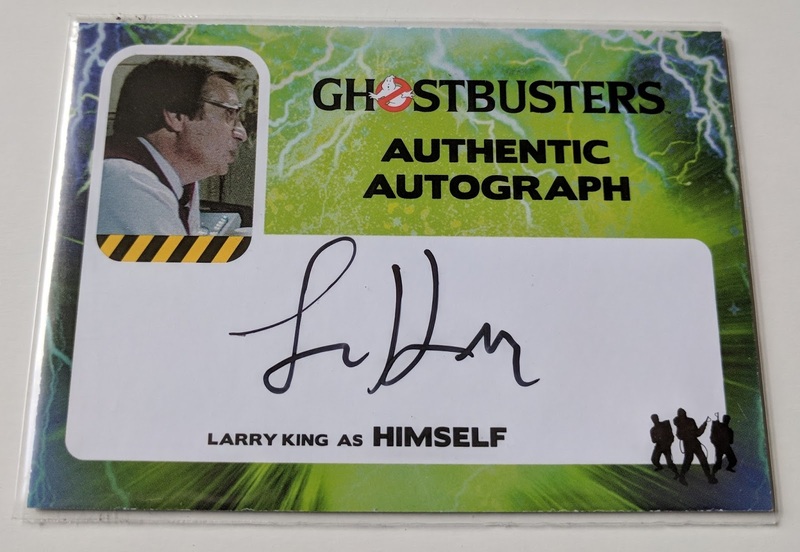 He has some auto cards out there (Mars Attacks, Scooby Doo), but for whatever reason didn't get an auto in this Ghostbusters set (maybe he was just too busy to sign), so I had to make my own fake auto. He was the voice of both Ray and Slimer in the cartoon, so I got a little creative with the split-screen picture on this one. Jason Reitman is director Ivan Reitman's son, and had a small part in the beginning of the sequel as the bratty kid who wasn't impressed with having the Ghostbusters entertain at his birthday party. 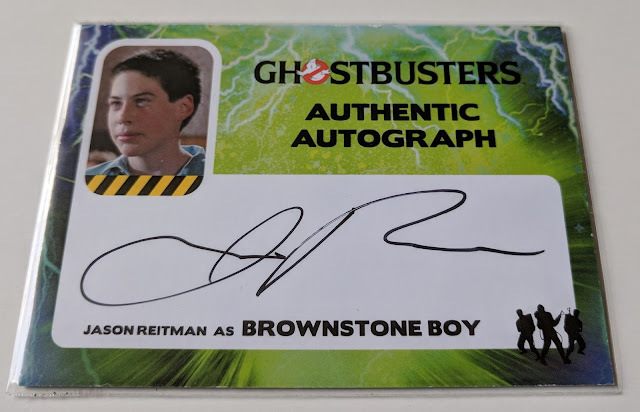 Seems like kind of a weak, random auto, but I'll take it. He has since gone on to direct the popular films Thank You for Smoking (2005), Juno (2007), Up in the Air (2009), and Young Adult (2011). And here's popa Ivan Reitman, director of both Ghostbusters films. He's been producer and/or director on a lot of great films, including Meatballs (1979), Stripes (1981), Twins (1988), Kindergarten Cop (1990) and more. 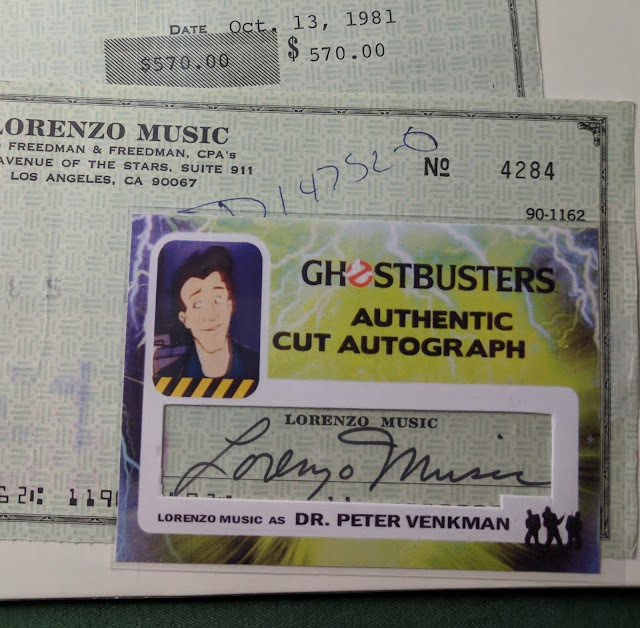 Of note is that his signature from 1977 is much different than the two from 1981. 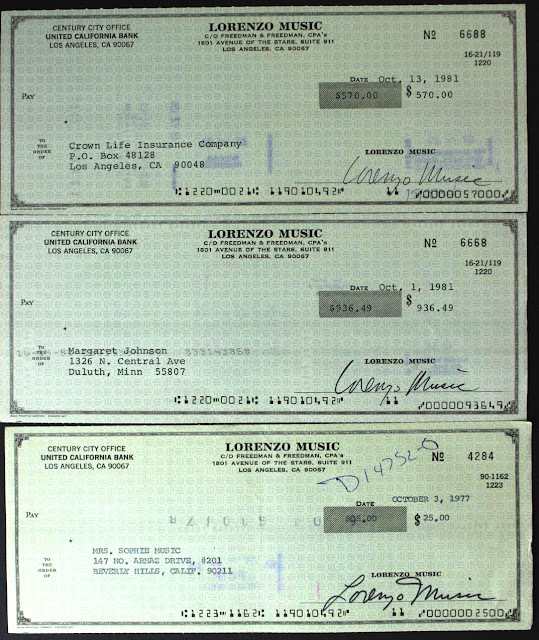 I gotta assume they're all actually from him, but he got lazy with his signature somewhere over the years between. But who knows. My plan was to cut them up for cut signature customs, though I'm gun shy with cutting these vintage pieces. But here's what it would look like, with the custom overlayed on the check. 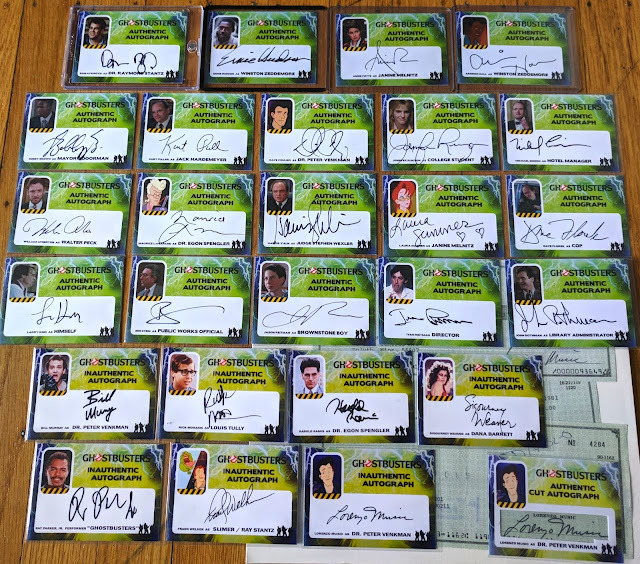 A handful of these inserted in the Cryptozoic product would have really been cool, but oh well. Maybe someday I'll get the nerve to cut this into a card. This might be my favorite sketch I've done this month, fittingly the last one, cranked out last night. 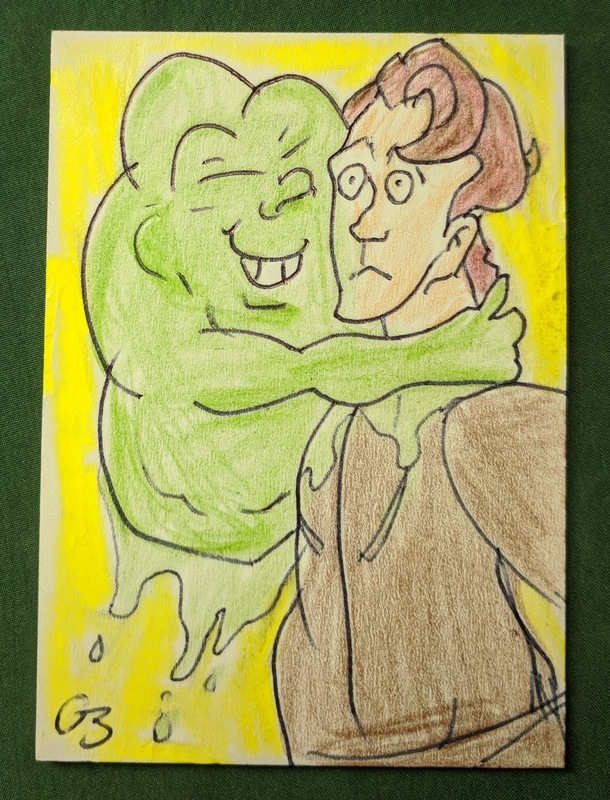 Slimer giving Peter a sloppy hug. 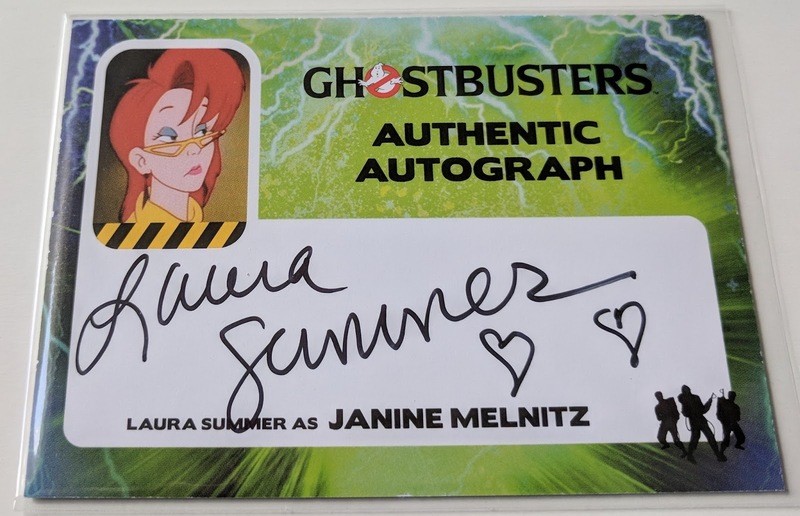 But circling back to the autos, this is my first ever completed autograph set! Big thanks to Dave the seller for giving me a couple nice bulk deals to help me knock off the cards I needed (securing those featured in this post just a week or so ago). And the customs really help round it out, if I say so myself. That's all 19 real autos, plus 7 supplemental customs, and one custom cut auto (kinda). My printer didn't quite get the color perfect on the customs, but close enough for me. 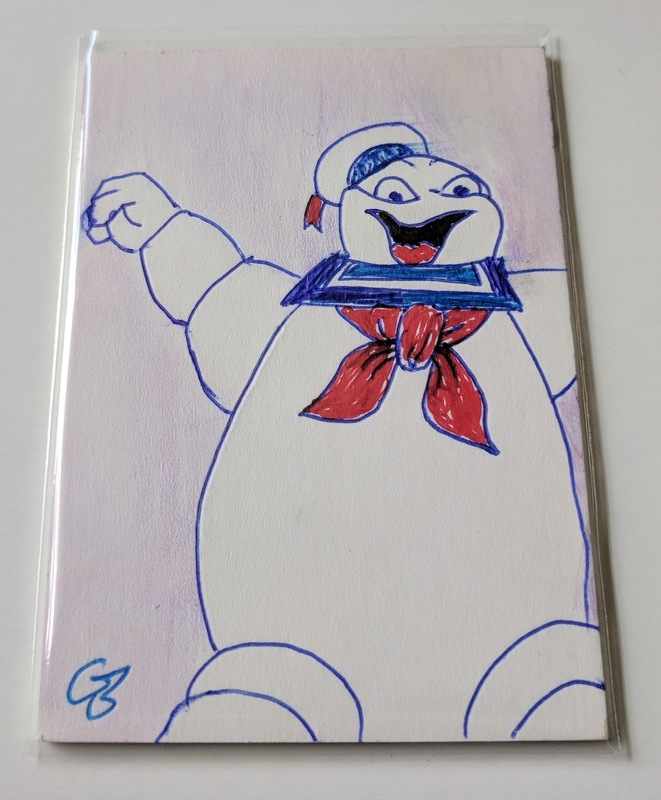 Thanks a lot to those of you who've been following along with the Ghostbuster Sunday theme month here on the blog (see also part 1, part 2, and part 3). It's been fun! I recently swung a big trade with Matthew Prigge of the Summer of '74 blog. He was the lucky winner of a Twitter contest and had some sweet cards fall in his lap that didn't exactly fit his collection, so I was able to step up and work out a deal for some of them. 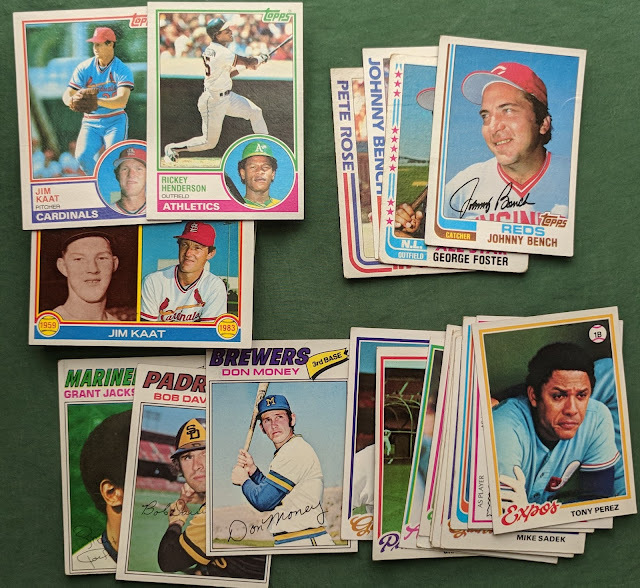 Among the stuff going his way were the many leftover dupes from my setbuilds of '71 and '73 Topps, plus my '79 Ozzie Smith rookie (which I'm now on a mission to replace) and more. But no remorse, as Matt sent a box that was loaded like a freight train. This beautiful Bowman's Best 25/25 atomic refractor auto is now the new best card in my decent little Carlos Correa PC. 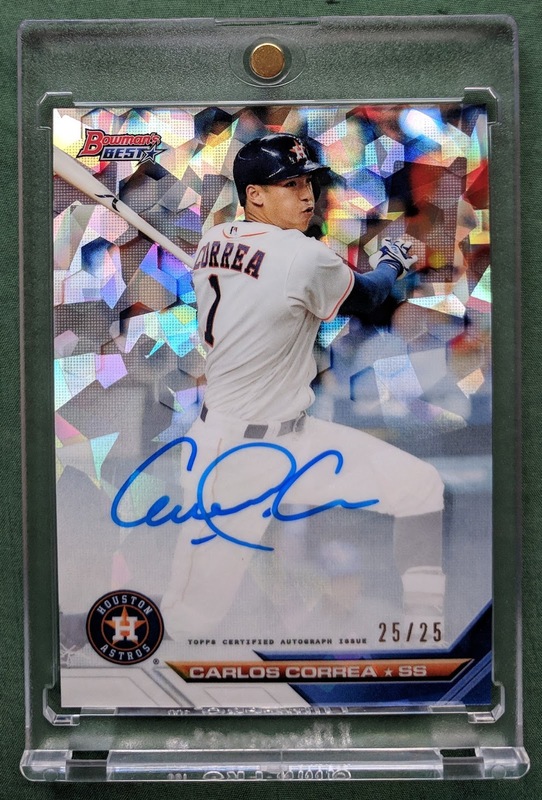 One bad mother, Correa is a great young player who was key in the Astros' championship run last year and looks to have an impressive career ahead of him. 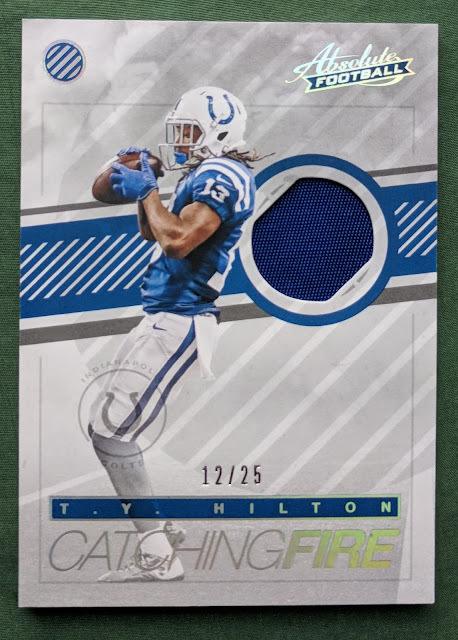 I don't know much about T.Y. Hilton, but Christmas Cards can make my motor hum. 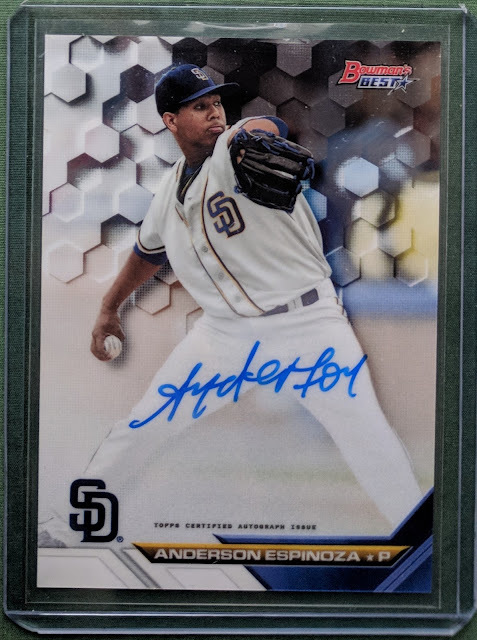 And the 3rd key card in our trade was this Anderson Espinoza Bowman's Best auto. I believe this is my 3rd Espinoza auto, all gotten from trades. Really hoping he comes back like a mean machine from Tommy John and makes his way up to Petco in the next year or two. 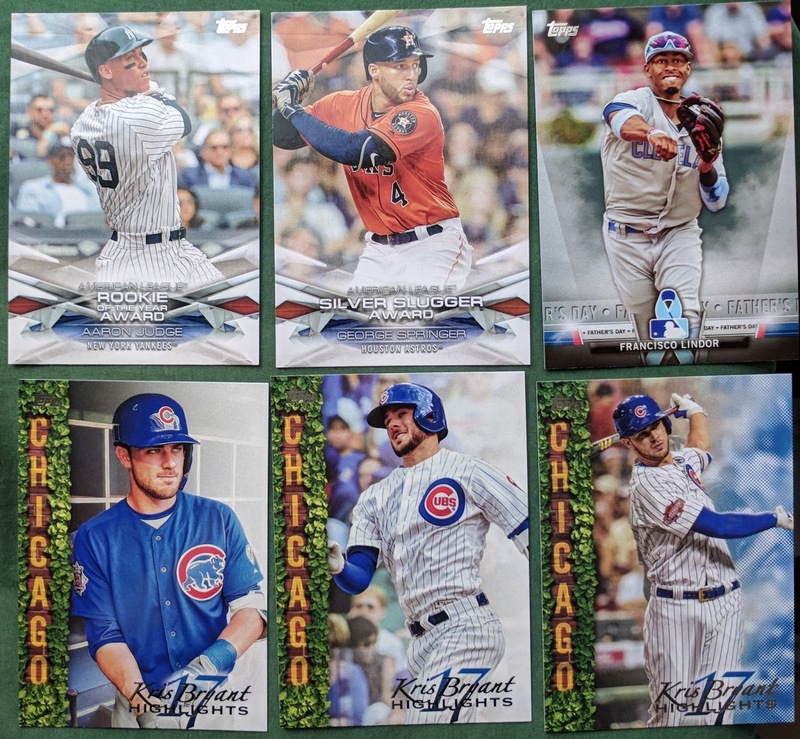 My first in-hand look at 2018 Topps! 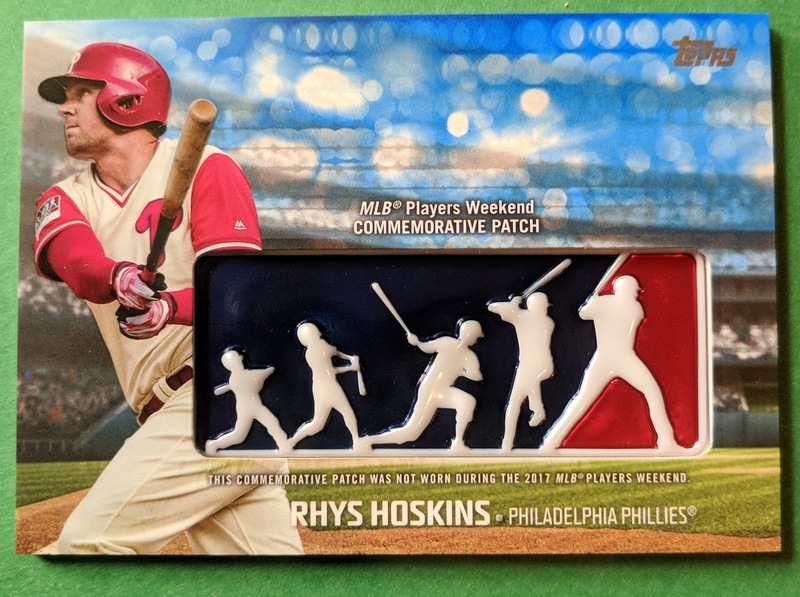 While I don't hate the design, I can't quite be arsed to actually purchase any myself, but will hope for trader buddies to fill PC needs here and there like this. 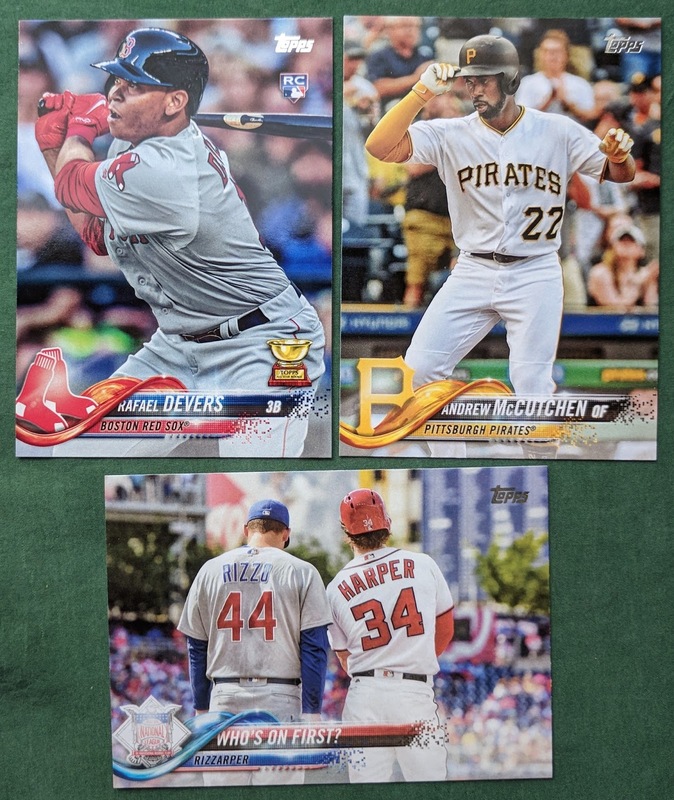 And some 2018 inserts too, featuring a lot of hot players like a Molotov cocktail with a match to go. Good stuff from Bowman's Best. 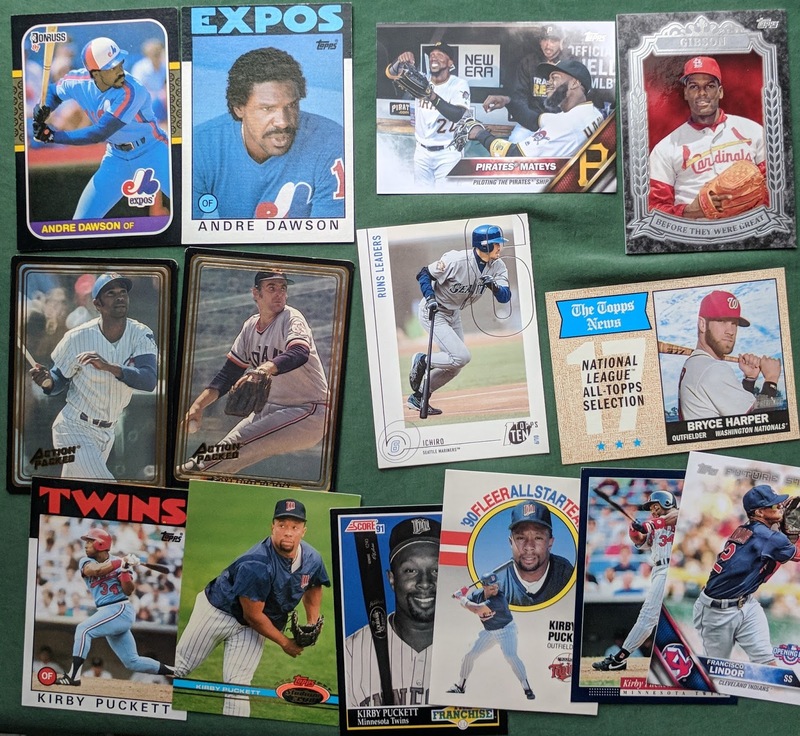 Several welcomed PC additions here. Bunch more guys I collect, including a nice Kirby lot and an Action Packed pair. And lots more! 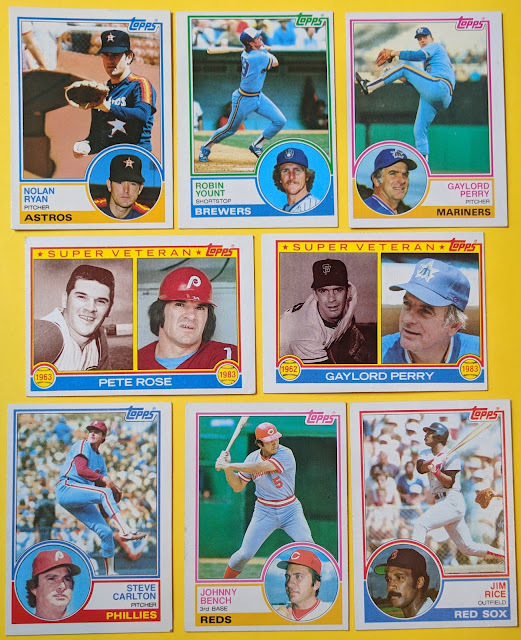 Love the Mike Schmidt "Future Star" quasi reprint. 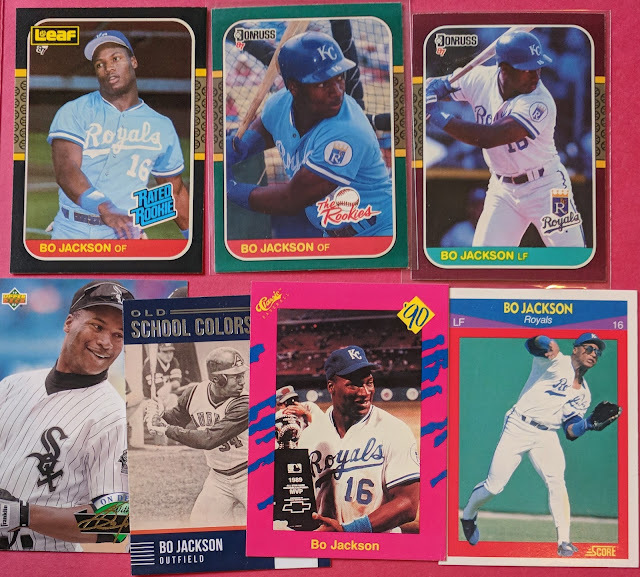 There was a decent lot of '83 Topps that included a Rickey I need for my setbuild, plus a couple Kaats for the PC. And some '82s, '77s, and '78s for those future setbuilds that I'll get serious about once I knock off a couple other current projects. Huge thanks again for the trade, Matt! Great stuff! It had me flyin like an airplane, feelin like a space brain.